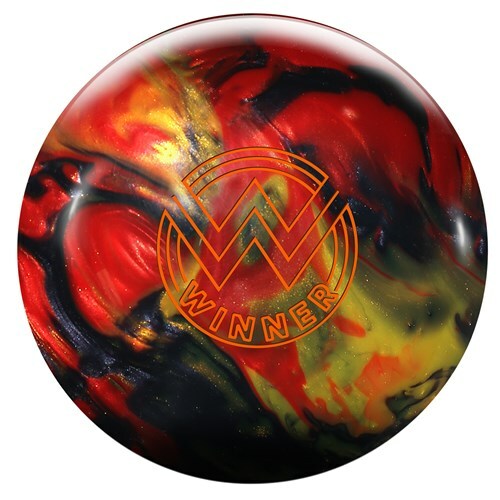 Roto Grip wants everyone to be a winner that is why they are introducing the Roto Grip Winner bowling ball. This ball takes the original Hotshot core and modifies it to decrease the RG and increase the differential in order to create more downlane reaction. This core is paired with the VTC-P18 Pearl reactive coverstock which maintains the balls traction all the way down the lane while storing energy for the backend. Out of the box this ball was designed to win on medium oil lanes. I absolutely love this ball as it instantaneously fills a gap in my arsenal and something I been looking for ever since the Hectic got discontinued. The best description and comparison I can give is that this ball is right in between a Timeless and a Hectic. It's not as powerful as the Timeless although it is stronger than the Hectic. The layout of this ball is 85 x 4.5 x 75. This ball will be a go to when the lanes transition and get into burn territory, somewhere after games 5/6. I had the opportunity to test this ball on pretty dry conditions which was the perfect environment for the Winner. I liked how I was able to get inside and slow hook it in the middle part of the lane; something I used to love to do with my Hectic. I didn't have to try and force the ball into more of a skid phase. I was able to keep everything at a normal pace and my hand slow. I maintained the pocket very well throughout the demo. The ball, also, hits very well as you can see in the video. For those looking for something like a Hectic and stronger than the HP1 line for when the lanes are dry I believe you'll really enjoy the Winner. Everybody likes a Winner! Roto Grip’s intention was to improve the HP2 line and I feel they accomplished their goal with the Winner. The VTC-P18 pearl coverstock and Altered Hotshot Core work well together. Roto Grip changed the density of the bottom slug of the Hotshot Core and improved the backend motion a bunch, compared to the All Out Show Off. The Winner responds nicely to the friction down lane. I could see where speed dominate players could throw it past the break point on fresh oil. The Winner is both an anomaly and completely expected. For one, it outperforms the HP2 line by a staggering amount, but this is also a normal thing for Roto to do with that line. It nearly has the highest symmetric core differential on the market right now, and is higher than anything in Roto’s HP3 or HP4 lines. However, it has a medium RG and the combination contributes to making it a ball with great length and a strong backend move. I think it’s a bit TOO easy down the lane, but it has looked very good for all Tamer’s testers, so in addition to a full and detailed review of mine here: https://www.youtube.com/watch?v=3ZlyYRM6a2M I would also check Tamer Bowling’s video review out as well. The Winner is a great pearl high RG ball from Roto Grip. I LOVED my Wreck-Em and was looking for a replacement and the Winner is the perfect replacement. It’s SUPER clean in the front and goes SIDEWAYS on the back. It’s the perfect ball for drier conditions. I could see using it on hooking house patterns right out the gate or switching to it later in a tournament to open up the lane. And it’s got unbelievable performance for the price! My stats: 16.5 mph ball speed, 285-315 rev rate, up the back type release with a high track. To summarize, medium speed - forward roll type of release with moderate revs. I put the WINNER at 60 x 5 x 30. This layout ended up with close to 1.5 oz of side weight which now doesn't require a weight hole as of August 1, 2018. I have thrown the WINNER on mostly house and our state Masters pattern. The WINNER is skid/flippy. I get easy push in the front with little effort and big move at the break point. I will probably have to either put a weight hole in to tame it some or smooth the cover up to about 3000 to get it to burn some of that push in the front of the lane. Compared to the ALL OUT SHOW OFF which this ball basically has replaced, I see it more push and more whippy down the lane. I changed my cover on the AOSO and got it to read well enough for me on higher friction house shots. I see the WINNER being a good ball down option if it is drilled weak enough to lay off in the back. The WINNER should be a great option for more friction. Don't be afraid to hit it with 3000 to smooth it out off the back end. "Tell me Cup, how does a great ball striker like you shoot an 83? Well I lipped out this putt on 18......"
I drilled my Roto Grip Winner 5.5 x 5 x 3. Compared to my Storm Match Up Pearl, the Winner gave me a similar motion with more over-all performance. The Match Up Pearl was my go-to ball when I started to see friction either in the front part of the lanes or just overall lane play. The Winner will be a bit more versatile because of the slightly stronger cover and core. While throwing the Winner, I noticed that on almost every shot, it continued to drive through the pocket and never deflected off the pocket. If you’re a tournament bowler or just searching for a good overall league option, the Roto Grip WINNER is the clear choice. We have a WINNER!!!!!!! The new Winner from Roto Grip is a remarkable piece. I used my usual 65*5*40 layout, pin above the ring finger with cg straight down. For a HP2 line ball it provides a strong change of direction downlane. Like some of the other recent HP2 releases, ShowOff and All Out ShowOff, this ball is a lot more aggressive than expected but definitely not in a bad way!!! The Winner provides really good length and very defined change of direction at the breakpoint. I did touch the surface of mine very lightly with a 1000 grit pad by hand just to knock the initial shine off because for me the OOB covers are just alittle too clean. The Winner for me has the same length as the old Hectic but is much stronger downlane. The closest ball as far as shape goes that the Winner compares to is the Storm SoniQ, with the Winner being less overall. For me the Winner is just a weaker version of the SoniQ, by atleast an arrow, but have very similar reactions on the lane. The new Roto Grip Winner is another big overachiever in the HP2 line. With a monstrous .054 Differential this thing will hook circles around everything in it's price-point. The Pearl VTC-P18 Coverstock helps that dynamic move happen downlane creating big angle at the end of the pattern. I've found the Winner to be really useful on house patterns. It's strong enough to throw on fresh oil with less angle and clean enough to stick with through the transition. Small speed and angle changes can keep the ball in your hand all night. It responds well to surface changes. The box finish can make it tempermental to down-lane oil but putting a little texture on the ball can smooth that out easily. I really like the box finish reaction on broken down lanes. When you really open the angle up with extremely steep left to right angles this ball really shines. Stand left, throw right and watch it come back. It has one of the most impressive carry abilities of any ball I have thrown in those situations. All of this from a ball that is classified HP2. The winner is a fantastic value, as getting it to match up with pretty much anyone is very easy and the superior performance for the price will impress anyone who buys one. The newest addition to the Roto Grip lineup is the Winner. With great looking colors, a nice price point, and stellar performance, the Winner is an easy choice to add to your bag. For players with rev rate, they will be standing left and throwing it right because of the shape it creates. For the straighter players, it will be a ball that will have a quicker response time and be a great compliment to their high performance balls when they start to burn up a bit. I’ve drilled one Winner so far and really like it. It’s mapped out as 5 x 4 and I put 3000 on it just to smooth up the surface a bit. As expected, when the pattern blends out and some oil gets down lane, the Winner is a perfect ball to go to. The cover creates length but also a quicker response time when it sees friction. I see this as a flashy ball to finish blocks strong with! At an attractive price point, great looking colors, and stellar performance, the Winner is a perfect addition to bags for the winter season. Go drill one! First of all the I used a new layout for this ball. I waited a bit before I drilled it, gathered information from other staffers, then went a different direction than normal for me. I shortened the Pin to PAP distance by a half inch. My go to pin down layout is 60x5x70. I went with 60x4.5x70. It was stronger than I anticipated! I was expecting something to use once the lanes broke down a bit, but that wasn't the case. I was able to use this ball on the fresh with a fair amount of success. Once I hit the surface with 3000 It rolled even better. It was very similar to the pin down Marvel Pearl which I had in my bag and I was able to use it longer than I would the Marvel Pearl typically. This is another home run in the HP2 line! Most definitely out performs the price tag! Really the perfect name! The VTC-P18 Pearl Reactive Cover stock is combined with an altered Hotshot Core. I think the Winner is similar to the Hustle Ink in the front part of the lane, much stronger on the back part of the lane, but not as much as the SoniQ. This ball is perfect for house shot’s that don’t have a lot of volume and aren’t very long in length. The Winner is an awesome symmetrical ball and a great addition to the HP2 line. If you don’t have one in your arsenal, it’s not complete. The newest addition to the RotoGrip HP2 line is the Winner. The Winner is super clean through the front part of the lane and has a booming backend. This dynamic motion is from the combination of the VTC-P18 Pearl coverstock and the Altered Hotshot Core. I was thinking about throwing the Winner on some short Sport patterns but decided to toss it on what everyone bowls on THS. I have a low rev rate around 300, ball speed around 15 mph, right handed and my axis point is 5 5/8 over and ¾ up. The layout I used was pin over the fingers with the CG kicked out about 2 inches with no hole. I believe the Dual Angle is 45 X 5.5 X 50. The Winner had generous length, mid lane control (even for a Pearl) and a very aggressive backend motion. The motion is similar to the All Out Show Off but with more forgiveness and more overall performance. The Winner allowed me to play up or to the dry with ease and this was something I did not fore see happening. The over under that I usually have with a pearl bowling ball was not there. I was surprised at how deep I could continue to more left and the Winner would get around the corner. The name fits what this ball is… WINNER! The Winner is going to be in my bowling bag for sure. The Winner is very much like the Hustle INK more bang for your buck. Page created in 0.679 seconds with 22 queries.